These works of caffeinated craftsmanship are a real treat for anyone with a wood-pulp brain. 1. If you spend a lot of your free time pondering ceiling fans, you’ll absolutely flip for this latte leaf. 2. With nothing but foamed milk and a toothpick, a barista just made some distant goon’s whole week. 3. 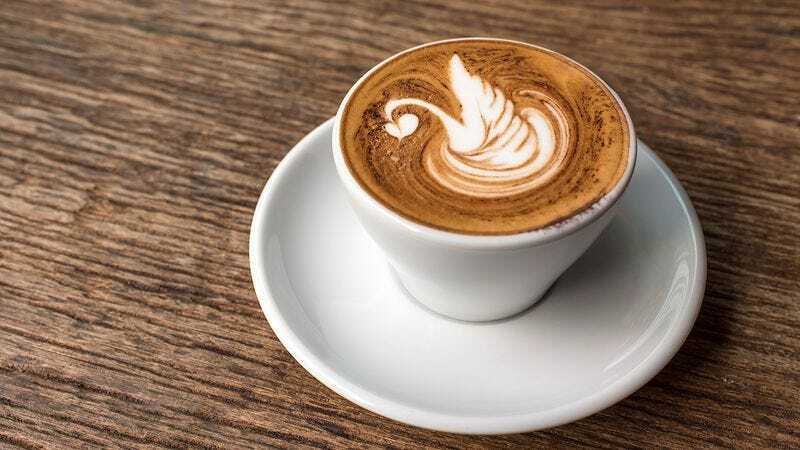 Okay, so this latte design is seriously awesome if you’re the type of person who refreshes the Wikipedia page for “cylinder” 15 times a minute. 4. Any lunk who’s gone this long without getting themselves backed over by a mail van deserves the thrill of this milk puddle that kind of looks like a swan. 5. Calling all oafs: Put down that book on the history of word searches and check this incredible pattern out! 6. If you spend most of your days scraping out the pot you boil old rags in to make your rag stew, you’ll definitely get a big kick out of this one. 7. To the thin-witted gum hoarder who eats their daily oatmeal off a Styrofoam plate, this 3D foam bear might as well be the face of God. 8. Plodding, insipid mind = blown.